These skewers couldn't be more fun or foolproof. Plus, the peanut marinade is a cinch. Mix first 3 ingredients in large bowl until well blended. Add chicken; toss to coat. Refrigerate 10 min. Heat broiler. Remove chicken from marinade; discard marinade. Thread chicken onto 8 skewers; place on rack of broiler pan. Broil, 6 inches from heat, 4 min. on each side or until done. Top with nuts and onions. Serve with hot cooked rice or ramen noodles and a tossed green salad. If using wooden skewers, soak them in water for at least 10 min. before using. This will help to prevent them from burning when grilling the skewered food. Turn leftovers into a delicious Asian-inspired salad. 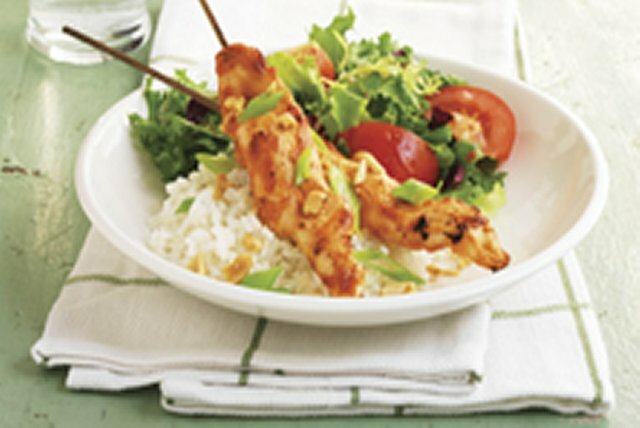 Just remove the chicken from skewers, chop and add to mixed greens and shredded carrots tossed with Kraft Asian Sesame Dressing.